The three individuals were sent to a hospital and released with minor injuries after a security guard's weapon accidentally went off during an altercation, Caritas of Austin's Community Kitchen said. 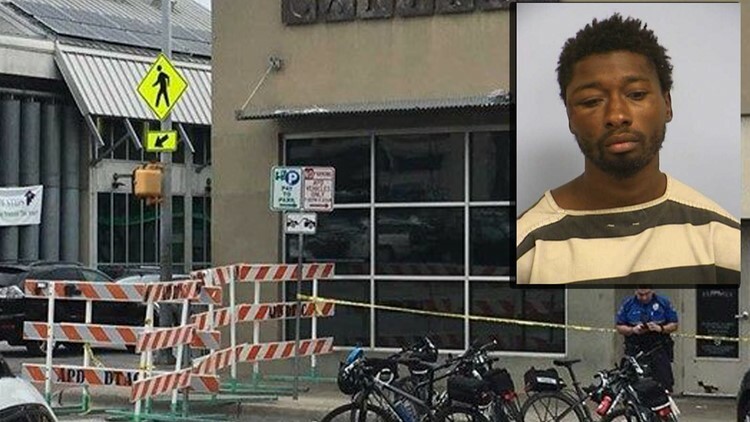 AUSTIN — A man was arrested after shooting a man and injuring two other people at Caritas of Austin's Community Kitchen Friday afternoon, Austin police said. Austin-Travis County EMS said they responded to a call of a man fighting with security at the 600 block of Neches Street at around 12:30 p.m.
An Austin police officer arrived on scene and could hear yelling before he entered the building. Upon entering, the officer saw a man, later identified as Phillip Lamar Southerland, on the ground fighting two uniformed security guards. The officer grabbed Southerland's arm and noticed a handgun on the ground within reaching distance. Once the officer had the man in handcuffs, he told the security officer to guard the gun. According to the affidavit, Southerland came into the community kitchen for water, but the place had already closed so they asked him to leave the property. Southerland then reportedly became agitated. As the guard tried to carry him out, the two fell to the ground. The man reportedly began to beat the security guard then grabbed the guard's gun, firing the pistol in the dining room of Caritas. The guard hit the man's arm and knocked the pistol to the floor just as it cleared the holster. The fired bullet just missed the guard's leg when fired, according to reports. A volunteer for the soup kitchen was injured when one of the bullets passed through a wall, hitting his right leg. Two other people weren't shot but were injured in the incident. They were taken to the hospital too. Southerland is charged with taking a weapon from a peace officer. He is also charged with placing two guards, 20 patrons, and eight staff members in danger of serious bodily injury or death. Caritas of Austin said the community kitchen will be closed Monday and Tuesday to "address internal safety protocols" so that such an incident does not occur again.